This is a testimonial about a couple that was going to have to sell their property in a down real estate market and would have lost over a million dollars from what the house was worth at its peak. Pacific Coast Vacation Properties helped the couple convert the property into an income producing asset as a vacation rental! I wanted to write to you and any prospective owners who may be considering vacation rental companies to manage their vacation rental. First, I have to say that there is no science to this business and I have learned this the hard way. Every house has different requirements. As most homeowners have experienced, homes always need repairs and costly fixes. This brings me to my first point. You have gone above and beyond to find air conditioning companies to repair & replace the air conditioning system installed by the now out of business HVAC company. I have to say that it would have been IMPOSSIBLE for me to do all the research on pumps and compressors while living in Italy. Meeting the variety of companies to accumulate the quotes for repairs was extremely timely and I really can't thank you enough for all your service. Now that we have covered the AC problems (and there have been dozens over 2 years), you have always maintained your professional demeanor with the guests when they were disappointed to find out they had no AC. I think in every case, you handled the guests with the best possible finesse. Problems will always come up and it's how they are dealt with is a true measure of the management company. As you know, I was with a different vacation rental company before you and I was extremely disappointed. I was impressed by the size of her company and all her staff. All her answers to questions were perfect. Having said that, after a few months of excuses and reasons why she could not book my house after promises to rent it for tons of money and high occupancy rates. Immediately after switching my business to you, the reservations started flowing in. You were able to book my house for great rates and booked reservations even in the off season enough to pay my mortgage, expenses and repairs (and then some) every month. I would be very happy to discuss my experience working with you with any potential vacation rental owners who are currently searching for their vacation rental manager. I have learned so much, if I can help them cut to the bottom line, I would be happy to do that. Let's just say the proof is in the reservations and you have done an amazing job managing my house. Thank you for saving my house from having to be sold. Now I have a business that will be my retirement in the future. Not only am I building equity in the house, I am making money monthly on the house. It hasn't all been roses, but it has been worth the difficult times and all the risk has paid off. Thank you! We are very satisfied with the management of our rental property in Capri-by-the-Sea by Pacific Coast Vacation Properties, owned by Greg Ross. When we purchased our condo in December, 2012, we had never had a vacation rental and didn’t know quite what to expect. Since we did not want the hassle of finding suitable renters, collecting rents and fees, and cleaning and maintenance, we started an internet search for someone to manage the property. We studied several internet sites and interviewed three property managers. The website PacificCoastVacationProperties.com was very well done and informative, especially under the “about us” tab. We made an appointment to meet with Greg and he came to our home in Rancho Santa Fe. We found him to be very personable and were impressed with his internet experience and organizational skills. Of importance to us is the fact that he lives locally so he or one of his staff is readily available to answer questions or to go to the condo 24/7 when a guest has a problem. Due to Greg’s thorough advertising, our condo has been rented ~85% of the time (giving us time for little get-aways there). Since prospective renters are prescreened, we have had very few problems. We have always received a check during the first week of the month and if anything needs to be purchased or a specialist needs to be called in for a repair, we are notified immediately. We highly recommend Pacific Coast Vacation Properties. Have you stayed with us? Write a review. This home is an adorable, old fashioned, comfy home that we fell in love with immediately. The style and decoration takes you back in time, we loved it! The beds are so comfortable. The kitchen is fully functional, with a great BBQ in the back. Everything you could possibly want, bikes, wet suites and so on are in the garage. The house and yard itself does not get a whole lot of sunshine even when the sun is shining, which keeps it cold most of the time, (perhaps because of the big ivy wall in back)but the beach is literally steps away. Great location to everything you want or need in Pacific Beach. Oh did I mention the lemon trees in the yard, how wonderful for the folks from northern climates. Thank you. We will call again. Your team was very willing to meet our needs and expectations. We felt confident that someone was only a phone call away and ready to assist us if necessary. We had the pleasure of meeting Greg, the owner, and he was very friendly, accommodating and eager to get our feedback regarding the home. If you are looking for a "home away from home" you have found it with this vacation rental. It is clear that Greg is determined to meet all expectations and be above the rest. This particular home has many extras;hot tub, waterfall, fire pit, super comfortable beds...So whether you are visiting for the sites or some R&R this is the place to be.We thoroughly enjoyed our stay. My family loved this house and Ocean Beach. We brought my 23 year old Son with us so the split level house layout was perfect. I also had to monitor my work email and do a few things so being able to set up at the little desk in the laundry area was perfect. Having a view of the ocean from the kitchen was wonderful and my Husband especially loved sitting out on the balcony every morning with his coffee and several sunsets over the ocean. We walked a lot, just like the locals do, to go to dinner, get a cup of coffee or just take a walk in the neighborhood. Totally relaxed at this home and area of San Diego. Our local contact was great! He even texted during a rainstorm to make sure we knew where to find an umbrella in the house. It was a very clean property, exactly as the pictures represented. I would certainly stay there again. Loved the pet friendly property, highly recommend it, attention to amenities detail and smart space utilization was amazing, we do hope to return and stay longer next time! We needed a place to stay while we were attending a 50th Wedding Anniversary party for my In-laws. The house was in the perfect location for our family events, as well as a short drive to local beaches, restaurants, grocery stores and shopping. 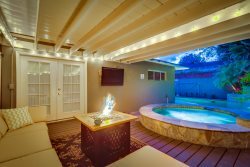 We especially liked the comfortable outdoor patio area and private backyard. I would definitely recommend this property. This vacation rental was a very spacious and comfortable "home away from home". Enjoyed the courtyard immensely which afforded our immediately family, extended family and our "new Marine" a beautiful, relaxing location to converse. Lovely Location! Had an amazing time, plan to be back next year. Great location, wonderful house. We felt completely at home in minutes! My children were delighted with the house. It is close to all major attractions in San Diego and at the same time it was quiet and relaxing. I cannot stop raving about how perfect it all was. Your staff was always friendly. The property was amazing! It had EVERYTHING we needed and so much more! Honestly you only need to bring your clothes and food becasue EVERYTHING else is provided! Beautifly maintained and decorated home. Everything you could possibly need for a great time to be had. I can't say enough about this fabulous property. My family would rent this house again without hesitation if we ever get back to the area again! Your team was eceptional. They answered every question quickly and professionally. The house was perfect exactly as represented on the website. Greg and Sheri were very nice to work with. The house is clean and well maintained. We felt right at home. The neighborhood is friendly and there are so many things to do. Our vacation was perfect. Thank you all at Pacific Coast Vacation Rentals. The team that I dealt directly with was very helpful. All questions were answered promptly and we had no issues on our stay! This house has a wonderful backyard and beds were very comfortable! Owner is very helpful. The house is a little further than we wanted it to be from the beach, but everything in your power was excellent! Very quick call back and email responses. We really enjoyed our stay at the Magic at the Point property! The backyard area was amazing and perfect for outdoor dinners. We live locally and would definitely stay here again without hesitation. It is located very close to Mission Bay, Mission Beach and Crown Point. It is larger and more comfortable than most rentals in the surrounding beach area and you cannot beat the back yard, it is beautiful! The inside of the property was very clean and well organized with great amenities. We found everything that we needed here. The property is on a major street but parking was not a problem and the surrounding neighborhood was very nice. All questions made prior to the trip were met by extremely friendly and helpful team members. Our experience with working with Greg and Sherry was great--they were very informative, and very available for all our needs. We stayed at Mount Helix during the week of Comic-Con so our adult kids could attend. One of my sons is disabled and this house was awesome for mobility in the house, as well as out to the vehicles. Loved cooking meals in the kitchen, and relaxing by the pool. Great place to stay for groups! Shari was very helpful in booking our vacation. Greg met us at the condo when we arrived to acquaint us with the security system, the layout and amenities in the condo, and gave us suggestions for family dining. My grandchildren had fun with his son while we were getting our introduction. All our interactions with the team members were very courteous, helpful and appreciated. Our condo at Capri By The Sea served all our needs with a comfortable and accommodating home base so convenient to all our activities. The views were amazing and we ended each day by going to sleep to the sound of waves crashing on the beach. Doesn't get any better than that! The staff was awesome . They answered all my questions upon making reservation and followed up the day before checking In to make sure I was ok. Great experience!! Our guest house was awesome!! It had all the amenities of home and then some. It was clean and just so comfortable for my family of 5. Extras like beach toys, boards , beach towels, board games, BBQ grill, outdoor fridge, hot tub, wifi, bikes. Just to name a few. We will recommend and will be back. Awesome experience! We felt very "taken care of" during booking and during the stay. Wonderful property. Exceeded our expectations. Perfect for our needs. definitely would stay again and would recommend to others. Working with the staff was a breeze....from start to finish. They periodically called us during our stay just to see if we needed anything or had any problems. What little problems we did have were taken care of immediately and in a courteous manner. There is absolutely no bad comments I could make about the staff and their professionalism. We loved our stay at the Hickory Street house. There were 11 of us altogether and the house was just the right size for a family reunion. Room to all congregate together as well as room to get away and be by yourself. Also enjoyed watching the fireworks from the top balcony at night. That was an extra little treat for us all. We couldn't have picked a better place to stay and would definitely recommend this little gem to anyone. Also want to thank Pacific Coast Properties for being such a great company to work with! Everything was AMAZING! Greg was very helpful and even recommended some places to see the fireworks for the 4th of July. Thank you Greg! The property was great! The kids (and adults) loved the pool and pool table!! It had everything we needed and fit all 11 of us comfortably. Room to hang out together and room to spread out so we weren't stepping over each other. We had never rented a house before and weren't sure what to expect, but this house was SO much better than staying in a hotel! In case you are new to renting a house like us - this one had plenty of bath towels, beach towels, hairdryers in every bathroom, and every appliance we needed. It was close to amenities and in a quiet neighborhood. Overall a great experience that we would definitely recommend to our friends and family. The Pacific Coast Team is awesome!! The Ocean Beach Oasis was amazing!! Pacific Coast Team was helpful with telling us all the great things to do around Ocean Beach!! We were in a desperate situation. We had been taken by a con man and had nowhere for us to stay. I discovered the situation a mere 4 days before the airport arrival of 11 women from all over the country. After looking online we spoke with Greg. He was so helpful. He arranged for a place that could accommodate all 12 women AND had a pool. He came to our rescue and we had a fantastic weekend. We could not have done it without him. Even working after hours to help us in our hour of need. Beautiful home + beautiful weather= FANTASTIC weekend! Everything we could ask for. Comfortable beds clean bathrooms and a great kitchen. The pool kept us cool and we all left with great tans. The large grill was a great help at dinner time. We needed a place that could accommodate 12 people with a pool very last minute and Greg came to our rescue and found us a great replacement saving us from a weekend on the streets! Easy to book....easy to stay...an easy step to a get-away! Clean, great amenities....super great place. Beautiful property. The kids enjoyed staring at home :) and of course enjoyed the beach but I didn't feel obligated to be outside the house to entertain them all the time, since they were having such a good time at home. We loved the board games and the chess.the backyard is awesome..
Great experience, Greg and Shari were very helpful. Great vacation rental with all the amenities and convenience of home, great value for the money. Everyone we dealt with were friendly, helpful and professional. This home was clean, well equipped and in a very safe and clean area of huntington beach area. Thanks you for sharing your beautiful home with us. We had a great time with the pool and all the games. It was a lot of room and it was perfect for our big family. We had a great time and got to see San Diego and the awesome beaches. We went to Sea World and were very impressed by the shows and what they can make the animals fo. We enjoyed our stay here. The was beautiful and cozy. We will most definitely be back for vacation again! Excellent stay. Staff was very friendly and the house was incredible. It was kelpt and had every amenity possible. We had a great time here. Our family hadn't been together for a a few years because our sons are going to school in other parts of the country. We were so happy to be reunited at this beautiful home with our sons, daughters-in-law, and granddaughters. Thanks for making this reunion possible! Thank you for allowing us to stay in your BEAUTIFUL home! We came to San Diego to be together for the one year anniversary of my fathers passing. Your home allowed us the retreat that we needed. We came from San Francisco, North Colorado, and Austin Texas to be together and spend time together. All of the grand kids loved the pool and games! We are hoping to make this a part of our next San Diego vacation. Thank you. This house was the perfect setting to spend our first annual "Quismo Vacation", the house is beautiful! It allowed us to soak in the San Diego atmosphere, spending time with the family. Thank you for allowing us into your home and allowing us to create many lasting memories! Jodi, We are sooooo Thankful that we were able of all houses for rent in San Diego to find this one!! My wife and I were so happy to spend this time with our kids here in this house. We spent the days @ the breach and the evenings and nights here at the house just enjoying time as a family. Everyone we delt with was great also.. the managers, the pool guy, the AC guy, The neighbors etc... thanks foir helping to add another blessing in our lives. © 2019 | Pacific Coast Vacation Properties, Inc. - All rights reserved. Pacific Coast Vacation Properties, Inc.